Circle City Chiropractic Blog It's Christmas in July! It's that time of year again! 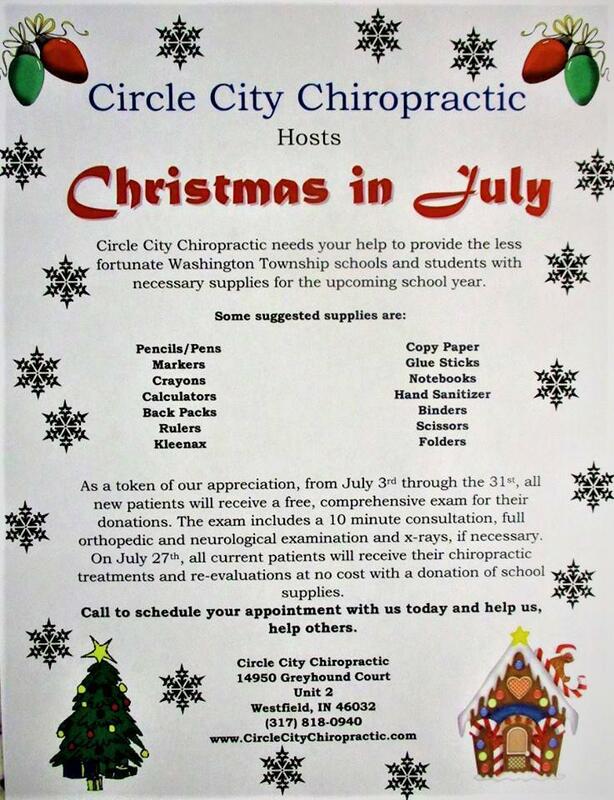 Circle City Chiropractic is hosting our annual Christmas in July as an opportunity to give back to the community that has taken care of us for so long. But this year we get to extend our outreach through our new satellite location in Westfield and the Northwest Carmel District! All month long, Circle City Chiropractic will be offering a full consultation, comprehensive examination and x-ray imaging for all new patients AT NO COST, as long as they bring in a donation of back to school supplies. Additionally for all existing patients, the Carmel location will be hosting a patient appreciation day on July 27th, waving the fees of all chiropractic services rendered, when they bring in a donoation of school supplies as well! Give us a call to get scheduled today and take advantage of this great opportunity to help us, help you!